So you wanna learn how to sign up for a Payoneer account, but don’t know how to do this? Don’t worry because in this post I’m gonna show you how to apply for Payoneer. So let’s jump into the main part. Sign up for a Payoneer account! 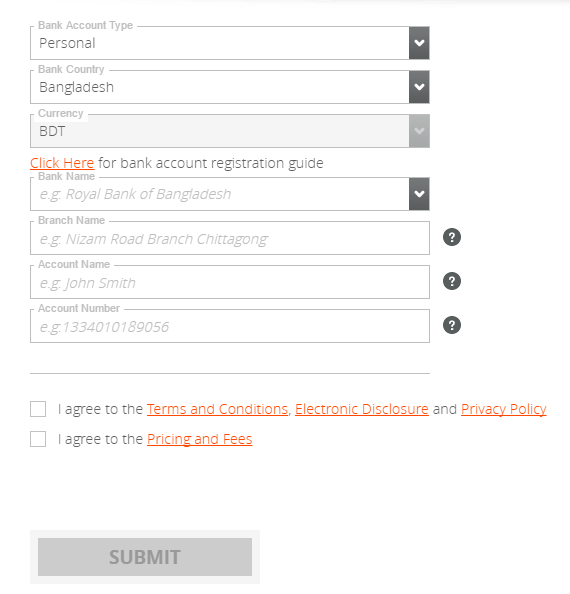 So it’s time to register for a Payoneer account right now. Creating Payoneer account involves with three simple steps. Now, I’ll show you the step-by-step guide to creating a Payoneer account. Sign Up for a FREE Payoneer account Now!!! Hitting the link will take you to the sign-up page of Payoneer where you’ll need to do some further tasks. After landing the page, you’ll see that there’s a button called Sign Up & Earn $25. Click on the button and you’ll land on the sign-up form. Note that the application process includes four different forms and you’ll have to fill out all of them one by one with the correct information. 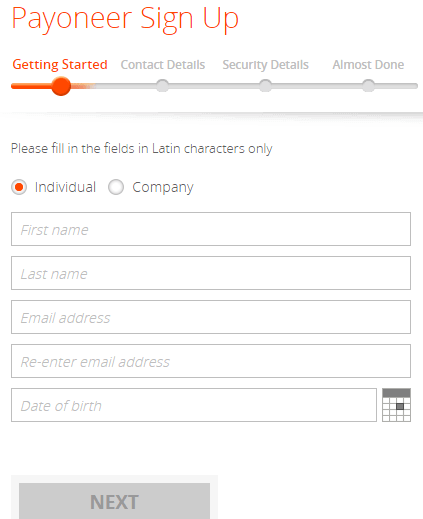 So, the first form comes up with the required fields for the first name, last name, email address, and the date of birth. So, you now have to fill up the form with all the exact information. You should check all the information very carefully before you proceed further by hitting the “NEXT” button. Note that you should write the first and the last name according to your bank account. The reason is that you may need to transfer fund from Payoneer to your local bank account. That time, if your name doesn’t match up with both the accounts, then there’ll be a serious problem in transferring your fund. You can see the progress of your account sign-up by following the top of the sign-up form. There’s an orange ball goes from left to right which indicates the stage of your sign-up. The previous one was “Getting Started” and now is the “Contact Details” stage. In this form, you’ll have to leave the name of your country, address, postal code, and the phone number. All of this information is also very crucial, so you should double check everything before you proceed further. Once the form is filled up with all the necessary information, you can now hit the “NEXT” button to land the “Security Details” section. This part is very important as it’s concerned with the security of your Payoneer account. You can see that the username is actually the email address that I used as my email address. So, remember that the username of Payoneer is the email address that you submit in your form. After that, choose your password wisely. Why do I mean that? The reason is that selecting a strong and unique password is a wise decision. 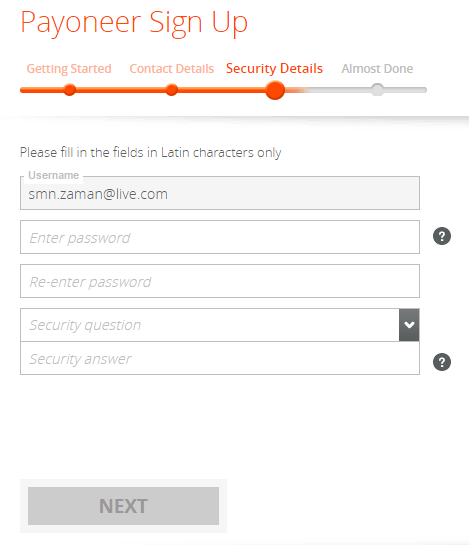 So, the password that you choose for your Payoneer account mustn’t be used for other accounts. Also, try to use make it as strong as you can. After choosing the password now is the time to retype it in the next box. The next option is for setting a security question. From the drop-down menu, choose your preferred security question and then write the answer according to the question. You should remember the security question’s answer because you may need to use it at anytime later. After filling up all the boxes carefully hit the “NEXT” button. This is the last form to sign up the account. So, the fourth and the last form comes up for the information of your bank account. Leave all the information exactly as it’s in your bank account. After completing all the filling up, you now need to agree to the terms and conditions and the pricing of Payoneer. Check the boxes and then, click on the “SUBMIT” button. You can see the email that states my name. It was actually sent to me by Payoneer. It’s seen that there are 3 steps to completing the sign-up process and now I’m at the second step – Review. So, applying for an account of Payoneer doesn’t mean that you have got on for you. The company will review your application and if they find it okay, then they’ll go to the third step – Delivery. The review of your application may take around 3 to 5 business days. So, you can do nothing than waiting during this time. I was eagerly waiting for my application’s approval so that I can wait for my MasterCard to get in my hand. Wow! 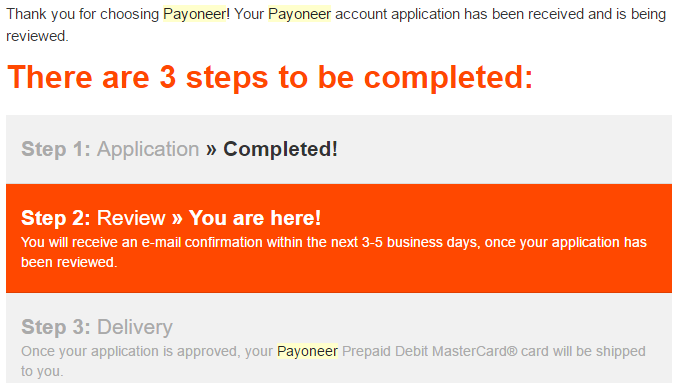 My application has been approved and now I can expect to have my Payoneer prepaid MasterCard within a month. You can see that there’s an estimated duration when I may expect to have my Payoneer card. So, I had to wait for some more days to receive my MasterCard. On a sunny day, I heard several calling bells at my home while I was working. So, I rushed to check who came there and saw that it was a mailman waiting for somebody’s response. Seeing me, he showed me the pack of which was my MasterCard’s. Initially, I couldn’t get that it was my MasterCard, but after reading the text on the pack, I did understand what’s there inside it. So, I signed off a paper carried out by the mailman as a sign of delivery and then I just jumped from the ground floor to cross all the staircases to reach to my working room. Entering the room, I took no time to tear off the envelope of the Payoneer MasterCard. Holding on the card, I felt like I won the World Cup football or cricket. Though there was no money in the MasterCard and it wasn’t yet activated, I was considering it like I could buy anything in the world using it. After getting the Payoneer MasterCard, you need to activate it. To activate the card, follow this article: How to activate your Payoneer account? From the article, activate your account. 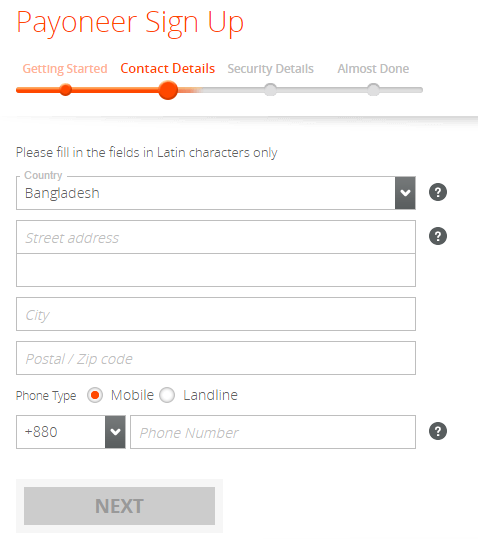 How to add funds to Payoneer MasterCard? How to receive money on Payoneer?